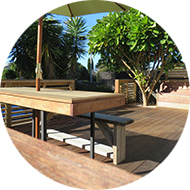 DeckedOut NZ specialises in decking and outdoor spaces in the Bay of Plenty and surrounds. With over 20 years of experience, we are knowledgeable and passionate about turning your ideas and inspiration into an outdoor reality. We can work from and through your ideas, combined with our practical building knowledge and problem-solving skills to see you through to a finished product and result that will exceed your expectations. 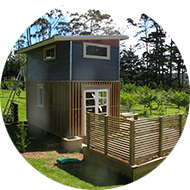 We provide qualified, LBP, and experienced builders for all projects. From a simple ground level deck project to an engineered, council required detailed project, we will make your outdoor dream a reality. We use a variety of decking materials including pine, hardwood and composite decking. 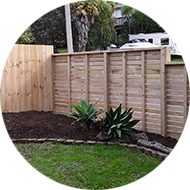 We can build simple boundary type fences or road frontage appeal and feature fencing and gates. We have a large number services we can offer. Click here to check out our services page and see what we can do for you. Can’t recommend Ben from Decked Out more highly. He built a large replacement deck and retaining wall for us seamlessly integrating the new structure around some of the older deck. An architect friend had drawn up a rough design for the space. Ben followed this as required but also brought his own good ideas and experience to the job helping us to develop the plan with practical design suggestions into something that totally exceeded our expectations. We were stoked with the way he transformed our outdoor living area. His quote was comparable but slightly cheaper than other builders, service was very quick, communication excellent,work tidy and well finished. And they were good blokes to have around. We’d have no hesitation in getting Ben back for any other work we wanted doing. Thanks Ben and all the best with the business. After reading all the great feedback Decked Out received we booked Ben in to build a new deck for us. The quote was very reasonable, and Ben kept us informed and helped us through the decision process regarding what wood to use, how to design the deck etc. Ben turned up early each morning and worked solidly throughout the day, cleaning up before he left. The overall result is better than we ever imagined. Ben’s workmanship is without fault, and we are so thrilled with how it looks. Ben was such a pleasure to deal with, so calm, patient, and professional. We cannot sing his praise loud enough and would not hesitate to recommend him to anyone. Amazing! Ben constructed a new deck and retaining wall and also replaced the old fence on our property. We are extremely happy with the end result and materials used. Ben’s workmanship is meticulous and the work areas were always tidy. I would highly recommend Decked Out to anyone looking to construct a new deck or carry out building works around their property. Thanks Ben. We recently made some additions/modifications to our existing deck and used the services of Decked Out Exteriors. We were impressed with Ben from the outset in terms of his prompt and efficient communication, his knowledge and his friendly manner. We were not disappointed as we found out that his workmanship was of an equally high quality and we are absolutely delighted with the finished product! Ben had committed to meeting an impending deadline of ours, which as it turned out meant he had to work a couple of solid days in torrential rain. Our indecision also meant that we evolved our plans while construction was in progress and Ben was only too happy to adapt and accommodate our needs. His was also the most reasonably priced of the three quotes we received, As the rating indicates, we can’t fault this company! We really appreciate your hard work Ben and we would not hesitate to recommend you to others (in fact, we already have!) Thanks again, all the best. We love decking! Let us build yours!